As you know annual support from alumni and friends has always been crucial to helping the law school accomplish our mission of Protecting It, Improving It, and Passing It On. 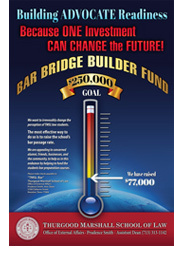 Your donations are used to support student scholarship, faculty development, ECI, bar bridge builder fund, student programs, and law school operations. If you have supported the law school before we are asking that you renew your support again this year. We are asking that you make a gift of $100, $250, $500, or $1000 to this year’s Share Your Success Annual Fund. You can do so by going to www.tsulaw.edu, go to “Giving Opportunities” at the bottom left side of the home page and click on “Click Here.” Or, send a check in the name of “TMSL” to the returning address. We thank you in advance for your support and look forward to you coming back to the law school and Sharing Your Success!!! We want to irrevocably change the perception of TMSL students. The most effective way to do so is to raise the school's bar passage rate. We are appealing to concerned alumni, friends, businesses, and the community, to help us in this endeavor by helping to fund the students bar preparation courses. The Earl Carl Institute is dedicated to identifying potential implementable solutions to legal and social issues disproportionately impacting the communities of color and other disenfranchised populations. 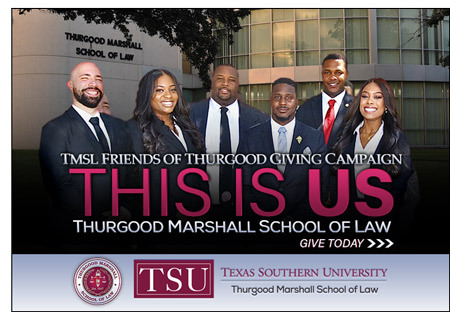 The Institute pursues, through academic and grassroots efforts, opportunities to promote policy changes for the betterment of the urban community and to fulfill the missions of the Institute, Thurgood Marshall School of Law and Texas Southern University.